This year’s dinosaurs are the cruise ship industry. The German-based NABU singled out cruise lines AIDA and TUI, based in Germany, as the representatives of their branch. 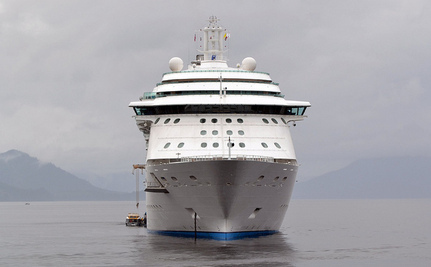 the 15 largest cruise ships emit as much sulfur dioxide pollution annually as all 760 million cars in the world. An AIDA spokesperson points the public to the annual AIDA Corporate Sustainability Report, where environmental efforts and successes are made transparent for all customers. AIDA voluntarily uses heavy fuel oil with sulfur content lower than 0.1%, well below what international standards require. NABU’s anti-award highlights not only the sulfurous emissions but the effects of particle pollution in the environments of natural beauty and species diversity visited by cruise ships. Black oil or diesel particle pollution falling on the white ice at the north and south poles in particular has been blamed for increasing the heat absorption from sunlight, contributing to the melting of glacial ice. Maybe eco-friendly cruising needs a second look. This post was originally published by Treehugger.